Let’s face it: travelling is much less stressful when you do not need to get yourself a visa. And if you never had such a thought before, believe me, you are either lucky – because you are the holder of a “valuable” nationality passport -, or you have never tried to get to many “off the beaten path” places. As citizens of Western countries, we are extremely advantaged in our travel options: you may get an idea of what getting a visa for a citizen of a Third World country means by reading this interesting article. As the author says, he “often has to fill out extensive visa applications months in advance of his trips”, when most of us generally only have to pay a few dollars for a visa on arrival. Or, even easier, we can get a free visa stamp. However, applying for some visas can bring a lot of stress and challenges also to many Western travelers: the infamous Russian, Iranian and, most recently, the Indian visas are all good examples. I think I may sympathize with the author of the aforementioned article as I am going to travel to some places such as Iran and Turkmenistan, and I start feeling the visa process-pressure. Requirements, fees and application processes are not very straight forward, to put it mildly. Sometimes, even the information displayed on different embassies’ websites is conflicting, making things even more complicated. Therefore, what is best doing? It is important to think carefully, especially when we are on the road attempting overland trips, and waiting around for visas is never the best option. After taking a deep breath, I generally sit down and start browsing the net for useful information. This may be a very biased starting point, but I still think that the best, most updated page to check current visa requirements and first-hand experience is the Lonely Planet’s Thorn Tree. Look carefully and type your quest specifically, as it is possible to get first hand information on the exact consulate you may want to apply for, and this needs to be considered as you plan your visa hunting on the road. 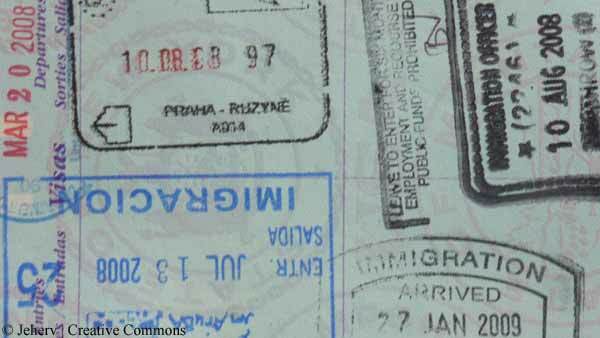 You may really want to change your itinerary if applying for a specific visa seems to be easier somewhere. This may save you a lot of foreign headaches. If you are in South East Asia, Thailand and especially Bangkok is generally a good place to ask for many visas, with Hong Kong being a close second: I personally was denied an Indian visa in Malaysia, to be granted the same request one week later in Bangkok. Same application form, same documents provided. A totally different outcome, and a concrete result: the making of my long awaited trip. At the beginning of my quest to cross Asia to Europe, I feel that by having done my research and homework, I may be able to make it without ending up in a dead end, no visa opportunity situation. In a sense, it is like we have been transplanted back to school: the ones who do their homework, will get good results. Because to many travelers, the feeling of having a stress free travel experience by holding a passport full of visas is pure bliss. I feel that it is right in that moment that a voyage really starts, and we can finally stop thinking of borders, and enjoy this incredible world.